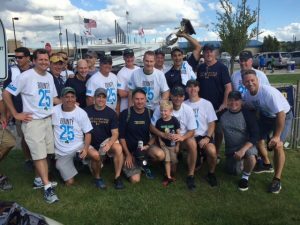 Gathered for a special 25th anniversary tailgater prior to the Notre Dame-Michigan State game on Sept. 17 was a group known as The Bounty. The Bachelor’s Bounty originally started among a few 1991 classmates from Grace Hall, centered around seven roommates — two that had serious girlfriends and five that didn’t. A wager was proposed that the two with serious girlfriends would be married long before the other five. The idea was born, and with a few twists quickly spread to 50 Grace Hall graduates each throwing $50 into a pot claiming they would be the last to be married. Most in the group know that the idea was the brainchild of Mike McKay, but not many know where his true inspiration came from. Mike ‘s dad was a 1961 Notre Dame graduate, but Mike never knew many of his father’s ND friends, because they never kept in touch after graduation. After meeting so many tremendous people at ND, Mike found it unfathomable not to keep in touch and swore he’d find a way to keep the friendships active after graduation. In the pre-internet age, he accomplished this by using the “Bachelor’s Bounty” wager as a reason to reach out and then as a way to stay connected via a quarterly newsletter updating everyone on the bet and those on the brink of elimination. Another classmate, Lee Polisano, was also writing a Grace Hall Newsletter and the two publications merged in the early 1990s which added some additional color. The Bachelor’s Bounty was the name of the bet, but eventually got shortened to just the Bounty and became a nickname refering to the entire group of guys in the bet. “Wead’s Wheels” was an offshoot of the Bounty concept and started around the same time after graduation in 1991 (Wead is the nickname of Bounty member Mike Nead, due to a typo on his first English paper as a freshman). There is often talk of a “Vision” that occurred as Mike McKay and Mike Nead were conversing in a Chicago bar about ND football weekends, the Bounty bet, and friendships at school. Nead declared to McKay that “we must get an RV for the Michigan game.” This annual football game and RV trip then became the signature event of the Bounty and could foster the continued connections with the group. Things took off from here. Really it was born out of a desire to drive a big RV and out of a fear of losing touch with friends. You could say the whole thing exists today because of a huge level of insecurity and 31 foot motor home. – A trophy was created where names were added to mark elimination. Trophy includes a birthday and a wedding date of each member. -For many years, there was an active web site that included all the newsletters and pictures from the weekend. (This is on its way back). – The big yellow balloon: initially constructed by a Rose Bowl Parade contractor, it is a marker for the tailgater and a symbol for the group. It can be seen from around campus and takes the challenge out of locating the group on gamedays. -Dance Party: Was a staple for many years after the game and often includes choreographed routines, a fogger, and a strobe light. Over the 25 years, there has been fairly consistent attendance at the games and now the members have email to help stay in touch during the year. While the Bounty may on the surface look like just a ‘guy bet’ and a guaranteed date on the calendar go see ND play football, it is at the heart a vehicle for maintaining and growing the friendships and bonds started while students at Notre Dame. The group has seen victories over FSU in 1993, a near upset over Nebraska in 2000, and lots of wins over Michigan including the shutout in 2014, but has also seen an engagement and three other marriages whose beginnings can be traced to a spark that occurred during a Bounty/Wead’s Wheels weekend. The group includes some very dedicated Subway Alumni who have not missed a game in 20 years. If you stop at the tailgater, you will see banners marking the games the guys have been to, t-shirts, hats, flags, home-brewed beer, catered food, and speeches/pep talks/poems given 90 minutes before kickoff via a bullhorn. Lastly, a few years ago, there was indeed a winner of the Bachelor’s Bounty wager, a number one seed, Mike Rodricks. He gracefully bowed out and then donated all the funds collected back to cover tailgating expenses for many years. The timing also sort of marked the transition and evolution of the tailgaters from just being single guys drinking beer and watching football to a full on family event. In addition, as a way of giving back, the group started their own scholarship fund called Bounty 3130. Which, at its heart, is just another way of forging new connections to the University. Probably the best complement the group has gotten is that other students have seen the success of the Bounty and replicated the idea. So 25 years are now in the books and without question another 25 years of this tradition awaits.